Easy, creamy and cheesy Slow Cooker Chicken Quesadillas made with juicy slow cooked chicken and mounds of irresistible melted cheese! Ohhhhh how I love a good quesadilla. I say “good” like I’m picky about my quesadillas and hold them to a high standard but if we’re being totally honest, I really don’t. Give me two tortillas filled with melty cheese and I’m a happy camper. Eventually I ventured out and started adding extra yumminess to my quesadillas. I still remember the first time I put ham slices in my cheese quesadillas – probably felt something similar to whatever was going through that dude’s head that invented the wheel. 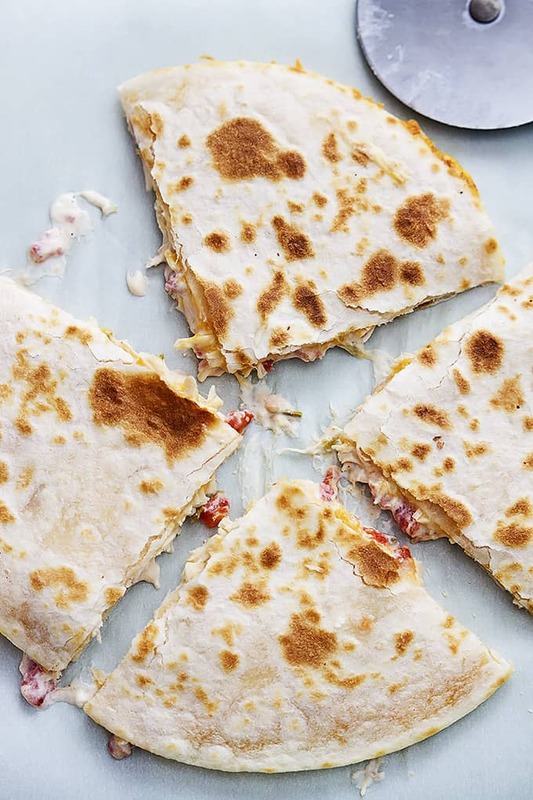 This though… this slow cooker chicken and creamy goodness thing that is happening… it’s a whole new level of awesome quesadillaness. The creaminess… the cheesiness… the chicken-ness…. It’s all too wonderful. And too easy. I love it when a few simple ingredients come together to invent something you wished you’d had all your life. And a bonus: everybody loves these quesadillas. Moms, dads, kids, babies (provided they’ve grown a few teeth), neighbors, high school teenagers barging in the backdoor at lunch time…. It’s a please-all. And everybody needs a please-all up their sleeve. 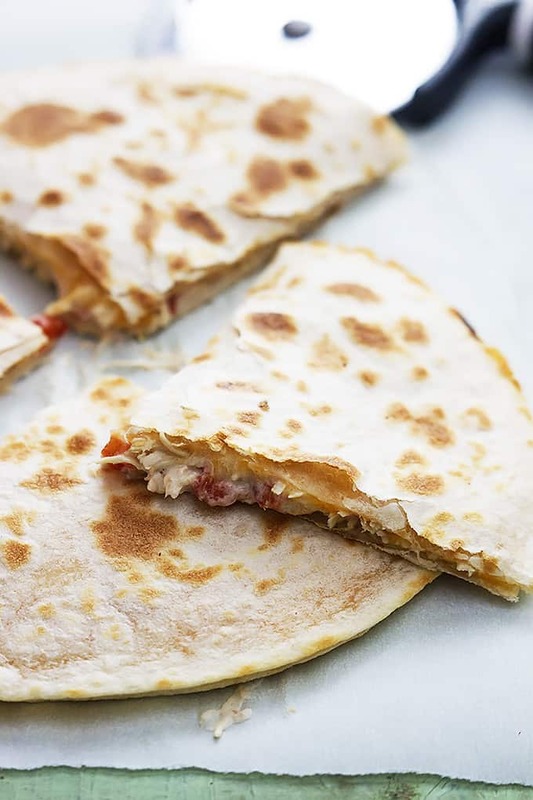 Easy, creamy and super cheesy chicken quesadillas made right in your crockpot! Add chicken, cream cheese, Rotel, and diced green chiles to a lightly greased slow cooker. Cover and cook on high for 2-3 hours or on low 3-4 hours. Remove lid from slow cooker, use 2 forks to shred chicken breasts. 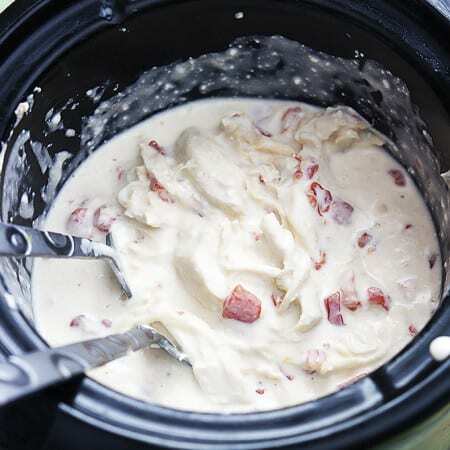 Stir all ingredients until creamy. Pre-heat a large greased pan or non-stick skillet over medium heat. Sprinkle 1 tortilla evenly with shredded cheese. Spread chicken mixture evenly on top of cheese. Sprinkle a little more cheese on top of the chicken mixture. Top with a second tortilla. Cook the quesadilla over medium heat for about 2 minutes on each side or until cheese is melted. (*see note) Repeat process with remaining tortillas, cheese, and chicken mixture. 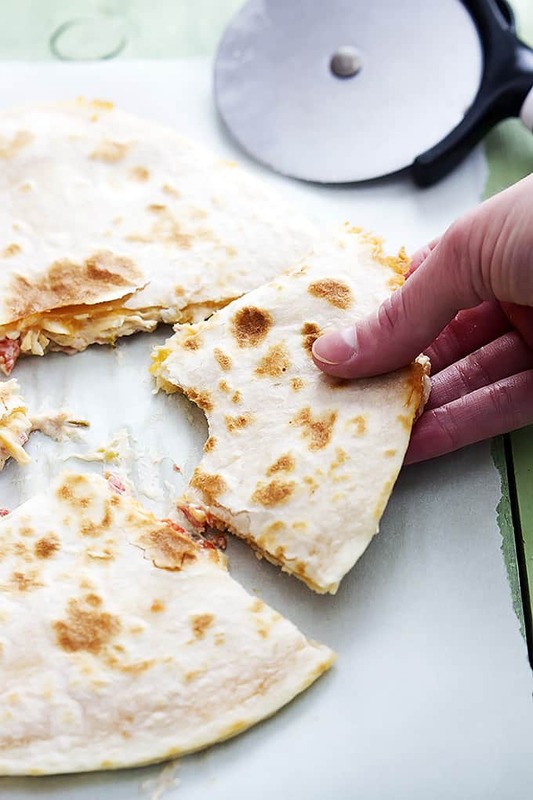 Use a sharp knife or pizza cutter to slice quesadillas into triangles. Serve warm with salsa or sour cream if desired. Alternately quesadillas can be cooked in the microwave. 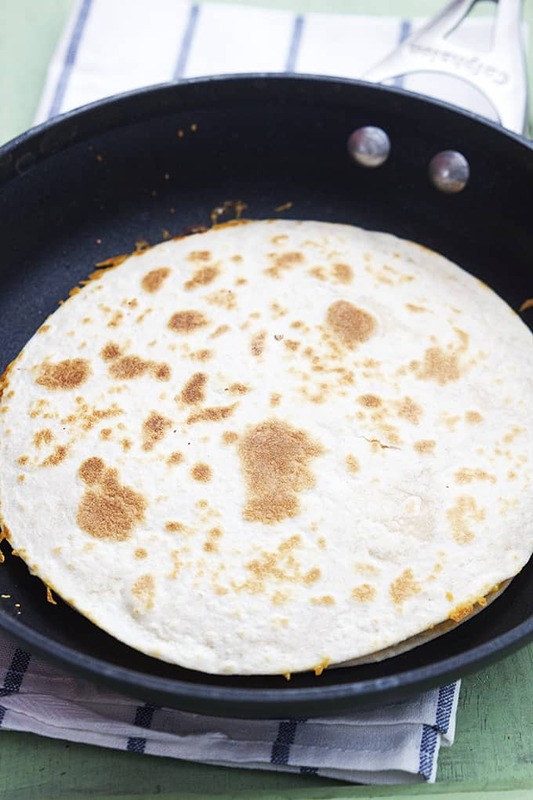 These look amazing – you gotta love a good quesadilla! This sounds delicious. I love the fact that 90% of this is done in the crockpot and helps to save time. When you have kids, a husband and a career you are always looking for ways to save time. I will try this recipe, I may add a few adjustments but it seems like and overall easy recipe. Thanks a bunch! These were absolutely delicious! We used corn tortillas and followed the recipe pretty much exactly how you say to you. Just in case it was going to be too spicy for my three-year-old I put half a can of the diced chiles and the rest of my 2nd 10-oz can of Rotel. (Our Publix didn’t have -5-oz cans.) It was delicious! Will definitely keep this one and eat it again and again. It was SO easy and delicious!!! thank you so much! I didn’t drain rotell & even the green chillies. And it is to runny. How can I thicken it? These were awesome! They satisfy my need for quesadillas without making me drive to Taco Bell at 10pm anymore. This is an amazing recipe! We made Pico De gallo and guacamole with it. We ate this for three days straight and loved every last morsel. 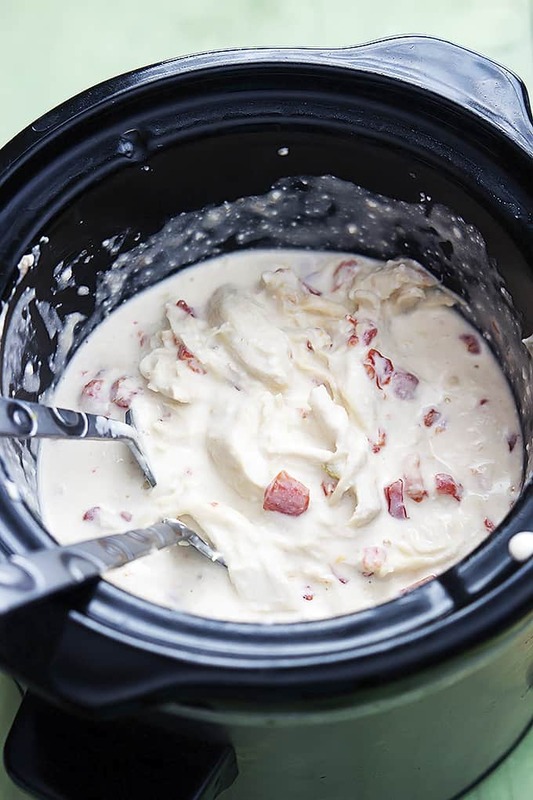 Thank you for posting this simple, yet awesome recipe, Tiffany.